The second week of the Champions League entertained Tuesday once again, but all the headlines were going to a five-goal thriller in Paris. PSG edged Barcelona with a phenomenal 3-2 win in a night that reserved history, as Totti became the oldest Champions League scorer with a goal vs. City and Xavi made a record 143rd appearance in the tournament. Meanwhile, Jackson Martinez rescued Porto with a last-gasp brace and there was just some spectacular football all round. Thomas Muller netted a penalty to secure three points for Bayern Munich as they saw off CSKA Moscow in an empty stadium. Due to racist behaviour from the fans in previous UEFA-governed games, CSKA Moscow were forced to play the game behind closed doors. Mario Gotze was fouled leading to Muller's well-taken penalty. Roman Emerkeno struck the post later but that would be as close as the Russians would come. Francesco Totti became the oldest Champions League scorer in history after his historic chipped goal cancelled out an earlier Aguero strike to take a point for Roma. Manchester City's leading goalscorer in Europe, Sergio Aguero, added to his already stellar tally with an early penalty. After a foul from Maicon, the Argentine rifled it into the right bottom corner and got the adrenalines racing early for the Citizens. However, Maicon continued what was a dramatic opening to his night, as he struck the woodwork with a ferocious shot just moments later. Eventually though, they'd lacerate through Man City's defences eventually. The Italian became the oldest Champions League scorer in history, waiting onside to race past Demichelis and majestically chip it over Joe Hart to put the visitors well back in it. Both fought relentlessly to the end, there was even a decent penalty shout for City, but when the final whistle blew, both teams deservedly took a point as a souvenir for their efforts. Paris Saint-Germain outlasted Barcelona in an incredible, goal-filled clash at the Parc des Princes which saw Matuidi claim the decisive goal. A fast start in the French capital saw Paris' big-money defender David Luiz seize on some poor marking from the Catalans to guide a free-kick past Ter Stegen for the opener. But, the hosts were given only over a minute to really relish their lead, as Barcelona conjured up some sublime tiki-tika buildup, that eventually found the first-time left foot of Lionel Messi into the bottom corner. Thiago Motta's ball in was met by Marco Verratti who put the French up ahead once again. Venturing in dangerously, he beat Rakitic to get a head in. The interval provided a chance for us all, including the stars situated in the Parc des Princes such as Beyonce, Jay-Z and David Beckham, to collectively catch breaths after a brilliant opening period of action. 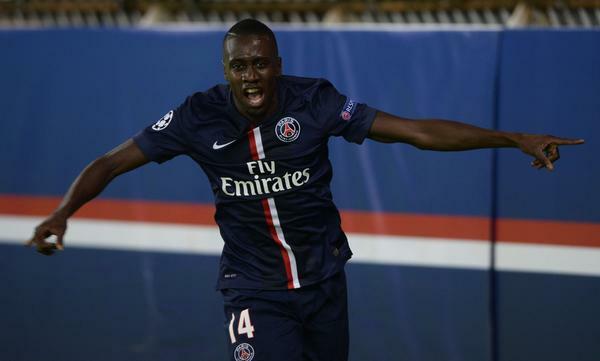 Blaise Matuidi calmly slotted away a beautiful buildup from the hosts in the second half to reinforce their lead. Incisive passing then a great ball was inch perfect to the powerful Frenchman who made no errors in blasting it into goal. Yet again however, Barcelona would retaliate within minutes. PSG were found puzzled as their defenders crowded the box but failed to extinguish Neymar, controlling the ball, before his side-footed effort clipped off the post and went into goal to reinvigorate the Catalans' chances. Late on with minutes remaining, Marquinhos made an outstanding challenge to block Jordi Alba's attempt in emphatic fashion. They held on, they kept out and they won. Apoel Nicosia and Ajax are definitely the smaller teams in their Group - but the way they played gave them a mere glimpse of hope, taking a point each after a draw. Andersen pounced on a well-saved ball by the Dutch's keeper Pardo to open the scoring for the visitors in Cyprus, but Apoel would soon strike back. Ricardo van Rhijin was penalised for handball inside the box and the hosts were awarded a penalty three minutes later. Manduca easily swept in to the bottom left corner. Estádio José Alvalade, Lisbon, Portugal. Nemanja Matic's first-half header was the decisive goal as Chelsea pipped Sporting Lisbon for the three points in Group G.
Nemanja Matic provided a powerful end product to a curling cross after Hazard was fouled to put the London side in the lead. He towered above his counterparts to open the scoring for the Blues. Chelsea managed to keep ahead, shutting Lisbon out of the contest. Job done, Mourinho. Klaas-Jan Huntelaar once again came to the rescue of Schalke as his second half goal brought back a point for the Germans. Vrsic audaciously went for goal from his own half in what would have been goal of the year. Fortunately for the opposing party, he was just off. Bohar stunned them late on though, as he put Maribor ahead. Steadfast buildup saw him notch in from a low cross to put the Slovenians up at the half time whistle. Huntelaar seized on a free ball to strike it past the keeper and put Schalke back in it, just like he did against Chelsea two weeks ago. Both sides take another 1-1 draw. A brace off the bench from Jackson Martinez salvaged a point for Porto in incredible fashion after a 94th minute equaliser in Dontesk. While he may have netted a sublime hat-trick last time round, Brahimi was denied early of adding to that total from the penalty spot. A brilliant save from the keeper kept him out and ensured it was still poised on a knife edge, goalless, at half-time. Shakhtar would eventually find the illusive breakthrough via a goal from Alex Teixeira. The game would spring into action five minutes from the stoppages. Bernard found Luiz Adriano to double Shakhtar's lead as they looked to seal it. But, a late penalty from Martinez finally beat the keeper to reignite Porto's fight. And in the 94th minute, it all paid off. Bate Borisov came back from a thumping loss to Porto to stun Athletic Bilbao with a sensational home win. Losing his marker from a corner, Polyakov scored a conventional tap-in after it was flicked on to his path. The hosts were leading and the Spaniards were at fault for some regrettable defending. Bilbao were rather stranded and helpless to stop the second. Karnitski's shot took a convicting deflection and went straight into goal. There was something to grasp on in the interval however, as the Spanish side snatched a goal back - just before the whistle a sharp turn from Aduriz and a shot at goal put the game open once again. They kept the lead alive and got the crucial victory. CSKA Moscow 0 - 1 Bayern Munich: This game was never going to be about the football - first, because we couldn't watch it and second, it was Bayern's for the whole thing. Thomas Muller's reliability from penalty spots is there for all to see. Maybe this will be the wakeup that any racist Moscow fans need. Manchester City 1 - 1 Roma: Yet again Manchester City can't keep a hold of their lead. They will be frustrated once again, but also satisfied considering it's looking down to both Roma and Man City for second place, with Moscow down and Bayern soaring. A monumental moment for Totti just shows his passion and Roma had a game of two halves - one with that passion, and one without it. PSG 3 - 2 Barcelona: What a game. By far the game of the night. Paris Saint-Germain just had something new to them. Even without Zlatan, PSG were resolute and held out. Barcelona were iconic in their quick responses however, David Luiz was vital in keeping them out in the final moments. What a triumph. Apoel 1 - 1 Ajax: With the heavyweights PSG and Barca stealing the spotlight in that group, its down to a Europa league spot for these two with all due respect. Both could have had their chances but its now down to who can scrape anything from the big dogs. Sporting Lisbon 0 - 1 Chelsea: Chelsea didn't bring all they could to the game. Diego Costa was muted at most and it was nervy. For an away day though they can take that, and the odds are in their favour for qualification by a long shot. Schalke 1 - 1 Maribor: Huntelaar to the rescue again - sensational stuff. You've got to feel for Maribor though who just seemed to expire and tire, losing their lead. Shakhtar Dontesk 2 - 2 FC Porto: Take a bow, Martinez. That's how you make an impact. Porto have been so entertaining this season but Shakhtar will be absolutely dejected considering they let it all go, when it looked like they had sealed it in the 85th minute. Borisov 2 - 1 Athletic Bilbao: Athletic Bilbao are looking worse for wear in Europe. Bate snatched a huge opportunity to open up new doors for them in the tournament. History, goals and brilliant football, that's what Europe is all about. Xavi breaks a record, Totti does the same. PSG prevail in a thrilling game in a night immersed in fame. Another sublime night of football. A complete and comprehensive roundup for the UEFA Champions League action on Tuesday 30 September 2014.